Port Everglades has given FIND a two-year fee-free License Agreement to use a 6-acre Port site to drain and dry approximately 300,000 cubic yards of dredged materials from a project to dredge the Dania Cutoff Canal for larger boats and yachts. This required a Maintenance of Traffic agreement, which requires FIND to have a sweeper/cleaner on standby to immediately clean spills/dust as the dried product is being removed from the Port. Port Everglades expanded its environmental efforts by signing on as a participant with Green Marine, the largest voluntary environmental program for the maritime industry in North America. Green Marine’s environmental program makes it possible for ports, terminal operators and shipping companies to voluntarily reduce their environmental footprint through a comprehensive program that addresses key environmental issues and criteria using 11 performance indicators including air emissions, community impacts, environmental leadership and much more. 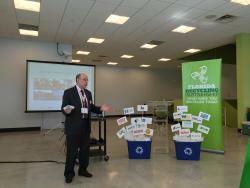 Port Everglades hosted the Florida Recycling Summit in Cruise Terminal 4, which recently received LEED certification. This one day event was presented by the Florida Recycling Partnership and brought together top Florida businesses and associations to discuss recycling efforts at Port Everglades and in the state. A representative from Port Everglades serves as a SEFCRI “Other/Citizen at Large” to represent stakeholders in southeast Florida.